CEBU, Philippines – Despite the weather disturbance, the image of San Pedro Calungsod arrived safely in Catarman, Samar last Tuesday for the start of the Visayas-Mindanao-leg of the Duaw Nasud. The image was flown by a Philippine Air Force chopper from Legaspi City, which was the last stop of the Luzon-leg. The image is escorted by Fr. Charles Jayme, the official custodian of the pilgrim image. Jayme, who also heads the Vis-Min leg, said that the image of the new saint received a very warm welcome from the people despite the heavy rains. “Kung unsa ka-init ang pagdawat sa mga taga Luzon, susama pod ang kainit sa pagdawat sa mga Bisaya sa imahe despite sa heavy rains kagahapon. It was a very moving act for these people who show their devotion to San Pedro Calungsod,” said Jayme. Children waited for the image for five hours to offer the image a dance. The image was in Tacloban City yesterday. It is expected to be in Maasin City today and Surigao City tomorrow to start the Mindanao-leg. The image will arrive in Cebu City on November 27 from Getafe, Bohol. A grand reception of the image at the pier area is being prepared by the Archdiocese of Cebu before it will be brought to his home at the archbishop palace. At 4 pm of the same day, the image will be brought to Guadalupe Church for the first triduum mass. 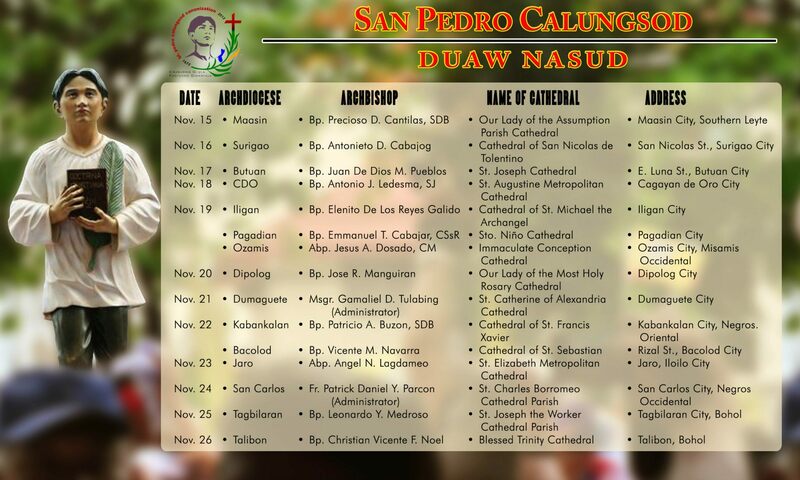 The succeeding masses will be at the San Pedro Calungsod Chapel in SRP, which will also be the consecration of the chapel. The last of the triduum will be held at the St. Joseph Shrine in Mandaue City. The National Thanksgiving Day is scheduled on November 30 at the template built at the South Road Properties. A foot procession will start at 1:00 p.m. while the fluvial will start at 2:00 p.m. from the Ouano Wharf in Mandaue City to the SRP in Cebu City. The thanksgiving mass will follow at 5:00 p.m. It will be celebrated by Cebu Archbishop emeritus Ricardo Cardinal Vidal. Fr. Jake Reyes, chairman for the committee on local pilgrims said that, they had allotted a special area in the venue for the local pilgrims from other provinces in the country. The area can accommodate 10,000 pilgrims. Fr. Reyes said that the city government through Councilor Bob Cabarrubias has asked the shipping owners to provide container vans which will serve as temporary shelter for the pilgrims.